May 1: At 1:30pm the Coast Guard received a call from a female on board a 43’ Grand Banks trawler who reported that as they were approaching Reedville her husband had collapsed and apparently died onboard. Rescue 1 was dispatched with Northumberland County’s Chief of Emergency Services Rick McClure onboard to intercept the vessel and provide any assistance necessary. The crew was shocked to recognize the vessel as being owned by a Reedville couple who were returning from their annual winter stay in Marathon, FL. The female reported that she was very capable of operating the vessel and that she just wanted to reach home. With heavy hearts the crew of Rescue 1 escorted the vessel to her pier where the proper authorities awaited. Time on call, 2.5 hours. This sad event is a reminder that if you are the captain of a vessel it is your responsibility to ensure that another member of your party can operate your vessel and knows how to call for help if your are disabled. May 28: At 4pm the Sheriff called Sea Rescue and asked if we could help a Sea Tow vessel that was struggling with a boat aground on the sandbar off Fleeton. Rescue 1 arrived on scene and found the Sea Tow rescue boat and a 40’ cruiser with flying bridge both hard aground in extremely shallow water at low tide. The crew on Rescue 1 determined they could not reach either boat so called for a second crew to bring Sea Rescue 2, a shallow water skiff to assist. Rescue 2 was able to carry 1,200’ of line from Rescue 1 to the Sea Tow boat and pull it into deeper water. Rescue 1, sitting in deep water, pulled and pulled but was unable to move the cruiser. It was agreed with the captain of the cruiser that Sea Rescue and Sea Tow would return the following day at high tide to again try and free the cruiser. The boat was in such shallow water that the captain of the cruiser was able to wade ashore into Fleeton for supplies before returning to sleep aboard his grounded boat. On the following day the crews returned and were joined by a boat from the Coast Guard station at Milford Haven. Rescue 1, the most powerful of all the rescue boats, again was unable to dislodge the cruiser and it began to look as if this would be a salvage operation, not a rescue. Incredibly, early on June 3, thanks to a powerful wind and an unusually high tide the cruiser floated off the sandbar and was intercepted by a local waterman who was able to tow it into a nearby marina where the captain, who was still living aboard, bought fuel. The following day the boat resumed its voyage for Portsmouth VA.
Smith Point Sea Rescue is a totally volunteer rescue unit which serves boaters from Coles Point to the mouth of the Potomac River, south to the Rappahannock River and across the Bay to the eastern shore. The organization receives no governmental monetary support and depends solely on donations to fund their operations. 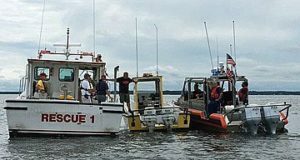 Smith Point Sea Rescue can be reached on channel 16 or by calling 911. Rescue 1 and Rescue 2 are based in Reedville and Rescue 3 is located on Lodge Creek near Callao.